3 Legged Thing, the British-based manufacturer of rock star-monikered camera supports such as the 'Brian' tripod and 'Trent' monopod, has announced one of the first accessories custom-designed for Nikon's Z system mirrorless cameras. 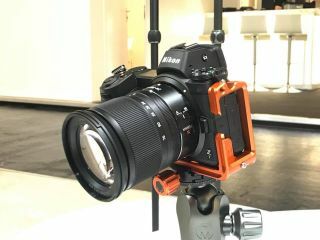 The 'Zelda' (which takes its name from a video game character) was made at Nikon's request, and the first prototype was on show at Photokina 2018. Production of the accessory has now been confirmed – with the bracket due to go on sale next month. The L-bracket enables a tripod-mounted Z system camera to be quickly switched between horizontal and vertical orientations, without having to readjust the tripod head, thus ensuring horizons remain level. This makes L-brackets much-prized by landscape and travel photographers. It is Arca-Swiss compatible – allowing it to slot straight into a wide range of tripod heads. Made especially for the Z 7 and Z 6, the 'Zelda' enables access to the card and battery compartments, as well as the various connection ports. It is also designed to allow you to still be able to tilt the LCD display. The L-bracket will be available in either orange or slate grey – and will cost £89.99 / $99.99 from February.